A museum's major function is to collect and preserve objects. As a museum, the Chicago Botanic Garden is dedicated to building its permanent collections, which are its objects. Living collections at the Chicago Botanic Garden focus on plants from around the world that grow well in the Chicago area and are adapted to the local climate and soils. The Garden’s permanent plant collections cover 385 acres and currently hold more than 2.6 million living plants. These plants are of native and nonnative origin and are found in the Garden’s public terrestrial and aquatic displays. The current permanent Living Collection includes trees, shrubs, vines, hardy perennials, and tropical plants, for a total of more than 11,000 taxa. It is the quantity, diversity, and health of these taxa (or individual types of plants), along with documentation and public access, that determine the quality and importance of a collection. Herbaceous perennials are the Chicago Botanic Garden’s largest and most extensive collection of plants. By definition, perennials continue to flower and fruit, year after year. Herbaceous perennials do not form woody tissue and normally die down at some period of the year in response to temperature, moisture, or light, and renew activity in the following growing season. At present, in total there are more than 2.4 million plants and propagules. The Chicago Botanic Garden has the largest collection of documented and labeled hardy herbaceous perennials on display in any public garden in North America. They range from 1-inch-tall thyme to 8-feet-tall compass plant (Silphium laciniatum) and are displayed as specimens, as ground covers, in mixed borders, and integrated sweeps of thousands of plants. The Chicago Botanic Garden’s woody plant collection is less diverse than arboreta (institutions specializing in woody plants) with large acreage, such as the Arnold, Holden, Morton, and National Arboreta. However, the Garden has one of the most extensive woody collections displayed in an ornamental garden setting, demonstrating landscape possibilities of any North American public garden. The Garden’s woody plant collection has a large percentage of cultivars compared to other public collections and the display and maintenance of these collections is recognized as one of the best. The Garden has a great rose collection in the Krasberg Rose Garden and elsewhere. As many new varieties of disease-resistant and hardy roses are introduced, the best of these will be incorporated into the Garden’s collection. The Garden will not collect disease-prone, nonhardy hybrid teas, floribundas, grandifloras, etc., unless they are famous for historic, cultural, or horticultural reasons. The Garden has a rosarian advisor for the collection. For the benefit of the Garden’s audience, students, donors, and displays, the Garden has developed a plant collection of great variety. The acquisitions to the plant collection are intended to represent the best plants for Upper Midwest gardens and landscapes, as well as the many microenvironments in the greater Chicago region. These plants are the most disease resistant, hardy, and beautiful plants for people to incorporate into their lives. It is important that the plant collection is viewed as a museum living collection and not just landscape decoration. The collection is an important genetic repository of native species, unusual nonnatives, and well-adapted cultivars that fare well in the Garden’s environment. As such, they are an important scientific resource for scholarly study, horticultural introduction, breeding efforts, verified references, and the Garden visitor. As a Plant Collections Network (PCN) member, the Garden is part of a North American consortium in which each garden agrees to conserve a certain segment of the plant population. Four genera at the Chicago Botanic Garden have been nationally accredited: Baptisia, Geranium, Quercus, and Spiraea. These plants were chosen because they provide an opportunity to address research issues; the Garden is already strong in these plants; there is sufficient curatorial support to acquire, develop, study, and disseminate information on these groups; they are adapted to the growing conditions of the Midwest; they are aesthetic; and they are relevant to the Garden's visitors and consumers. It is estimated that the genus Quercus contains more than 500 naturally occurring taxa that are widely distributed across the northern hemisphere. No single institution is capable of forming a complete collection of oaks due to climatic and physical space limitations. The Chicago Botanic Garden took part in establishing a multi-institutional Quercus collection in 2007 with 20 institutions across the United States, including the Missouri Botanical Garden and the Denver Botanic Garden. 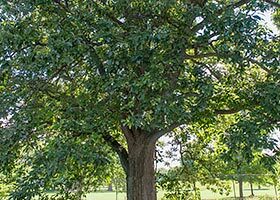 Oaks are quintessential to Midwest landscapes and are suitable for both gardens and natural areas. They provide long-lived, large-scale components to the collection that transcends generations. The Garden currently holds 81 taxa of Quercus. Spireas grow in the temperate regions of Europe, Asia, and North America all the way south to Mexico. 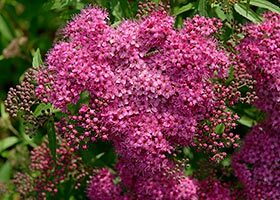 The shrubs are well adapted to the climate and soils of the Chicago region and are drought-tolerant and low maintenance. Spireas are known for their white-pink summer flowers, spring and fall foliage color, and smaller size. This makes them useful and adaptable additions to midwestern gardens and ideal for urban and suburban landscapes. The Garden has been a leader in diversity of Spiraea since 2003, with its current collection of 27 species and 49 cultivars. The collection will continually expand to increase diversity, with plants added from cultivated and wild sources. Hardy geraniums occur naturally in every country of the world, excluding Antarctica. Perennial forms, which make up the bulk of the genus, have a lengthy flowering season evident here from May to October. There are species adapted to sun, shade, and a wide variety of soil conditions. Hardy geraniums are usually clumping plants, but their trailing stems make great groundcovers. A handful of them acquire colorful fall foliage too. They are favored Midwest landscape plants with multiple attributes. 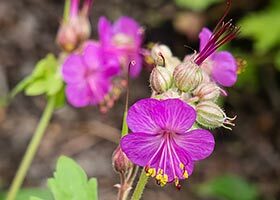 The Garden has the largest number of Geranium taxa in the United States and acquires more every year. The collection started in 2007 and consists of 160 identified/known taxa (including 118 cultivars). False indigos are a popular North American native perennial once used as a source for blue dyes. The Baptisia collection at the Garden consists of around 56 individual taxa represented by over 2000 plants. 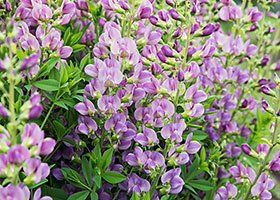 Much of the Garden’s Baptisia collection was acquired by Jim Ault for use in the Chicagoland Grows® breeding program. Baptisia x variicolor ‘Twilight’ Twilight Prairieblues™ was bred and introduced by Ault in 2006, followed by the multi-colored Baptisia ‘Lunar Eclipse’ in 2016. Consisting of both cultivated varieties and wild-collected species, Baptisia can be seen blooming in vibrant blues, purples, yellow, and white throughout spring and into early summer. Complex hybrids have been created between Baptisia species, resulting in more than 50 cultivars available in the nursery trade. Richard Hawke has conducted significant evaluations of available Baptisia cultivars with the results being published in Fine Gardening magazine. The Garden is endeavoring to collect all eighty-seven taxa of false indigos in the coming years, and will continue to seed bank these accessions in the Dixon National Tallgrass Seed Bank.